Microsoft Gold Partner and top 1% global Dynamics 365 provider Mint Management Technologies was recognized as the Microsoft Dynamics 365 partner of the year at the Microsoft Partner Network Awards 2017 and was also deemed a finalist in both the Application Development and Cloud Productivity categories. The Dynamics 365 Customer Engagement Partner of the Year Award recognizes a partner who differentiates themselves as premiere industry providers of Dynamics 365 that deliver modern intelligent experiences and services that connect all the data across an organisation to help their customers make better, faster decisions and achieve optimal outcomes. 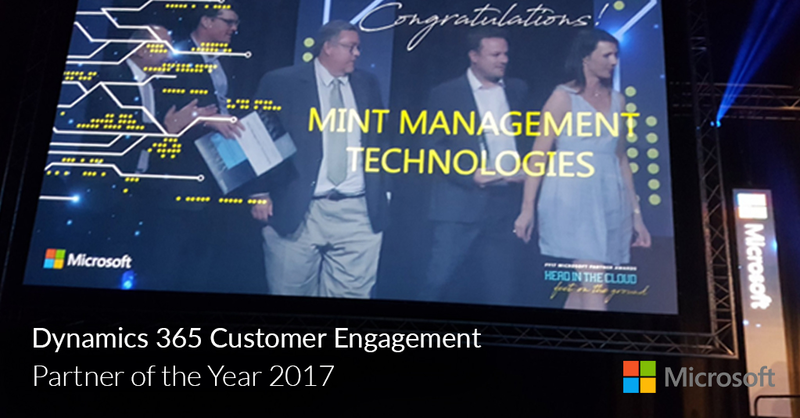 Mint Group CEO Carel du Toit notes that the Dynamics 365 recognition showcases the organisation’s commitment to customer engagement, as well as the continuous transformation and innovation of its Customer Centricity (CC) practice. Among Mint’s Dynamics 365 implementations in FY17, du Toit highlights the role that it played in the development and implementation of South Africa’s National Department of Health which is already driving improved service delivery and healthcare for the country’s citizens. In addition, the organisation’s Anti-Money Laundering solution developed for Africa’s Financial Services Providers has helped the financial services industry to not only curb illegal activities but also use the features of Dynamics 365 to increase customer retention rates. Reflecting on the organisation’s key differentiator with regard to customer relationship management, CC Practice head Rynhardt Grobler states that Mint’s unique approach to enabling clients to unlock cloud value, and its proactive approach to identifying all requirements and loopholes prior to an implementation, facilitates the seamless blending of people, processes, and technology, thereby, keeping costs down, efficiencies up and customers happy.